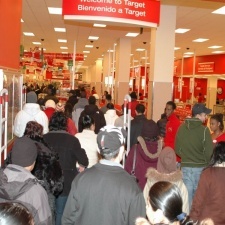 Once upon a time, Black Friday was a spectator sport for much of the world. Non-Americans would sit down after a long week at work at the end of November and watch the news, which inevitably would end up featuring a lot of Americans charging into a Walmart and fighting over reduced stock. Now, this is a global phenomenon and one that isn't healthy. The whole point of the sales event initially was to help shift warehouse stock that wasn't going to sell otherwise at low rates to drive huge sales and - wait for it - get back in the black. Not only was it a good way for retailers to empty up some space in their warehouses, it got consumers spending at a time when they would historically have refrained from splashing their cash in the run-up to Christmas. Now, more or less anyone selling anything is in a race to the bottom on price - and it isn't even on old stock. Increasingly, you can easily find companies selling products that are brand new just days after launch. Right now you can buy Fallout 76 from Bethesda's own storefront for £33.49, down from £49.99. That game came out just over a week ago. One week. We are still decisively in that project's launch window and Bethesda has opted to lose £16.50 per sale. A similar deal is up on Amazon, too. At physical retail in the UK, we've seen retailers such as GAME selling - frankly - absurd bundles of content - consoles with several games at well below the asking price. Much of these deep cut deals aren't helpful, aside from the simple act of getting consumers in-store and hoping they spend more while they're there. In fact, in the past, it looks like physical retailers have actually lost money during the Black Friday sales. While data firms like GfK Entertainment and NPD can release figures saying how much hardware and software was shifted - and how much cash was brought in - the months and weeks before tend to be much softer. It isn't just physical that's affected by this sales event, either. We have our own digital sales events in the Steam Autumn Sale, itself a precursor to the Winter Sale which features the deepest cuts. Having these kinds of annual sales events trains consumers to wait. If they want your game but know that in November, it'll be reduced by 50 per cent, then they're not going to spend their cash before, so developers receive much less money at the end. The reality is that the margins on selling games - physically or digitally - are already pretty low as it is. Making a living as a developer is a ridiculously hard thing, especially at a point in time when there is more content in the wild and more choice than ever before. Having a lower RRP than the competition is certainly a way of standing out, but ultimately that results in a race to the bottom where no-one wins. A company like Amazon forcing someone like GAME to play their, um, game makes sense - the online retail giant is trying to slowly drive any competition out of business. But ultimately, developers shouldn't be slashing the price of their games. Sure, more consumers will play it, but this is hard work that you have put effort into. Cutting the cost of entry to such a degree only serves to devalue not only your product but you, too. Oh, but if you want to come along to PC Connects London 2019 on January 21st and 22nd, we have a tidy Black Friday discount code for the event. Buy now to save big! What makes a good game development showreel?